DVD is still an important way that users play and watch movies. However, technology changes. When Apple removes the optical drive from MacBook Air, iMac and other computer, users get confused on how to play DVD on MacBook Pro/Air, iMac etc without hard drive. For example, there is a user on Apple Communities crying that "I am completely ignorant when it comes to macs". There are even owners of Mac computers with hard drive having trouble to play DVDs smoothly. In this article, we will show you all the methods on how to watch DVD on MacBook Pro/Air, iMac, Mac mini with/without hard drive. You will see it's not that hard. It will convert DVD to MP4, H.264, MPEG4, MOV, M4V, and MP3 etc to save and play movie files on ultra-thin MacBook Pro/Air, iMac without hard drive. The removal of optical drive from Mac computers doesn't mean that there is no longer a way to watch DVDs on MacBook Air/Pro with Retina Display, iMac, Mac mini without hard drive. Instead, there are a few ways that will allow you to do this easily. The most direct solution to Mac without hard drive is to give it one. 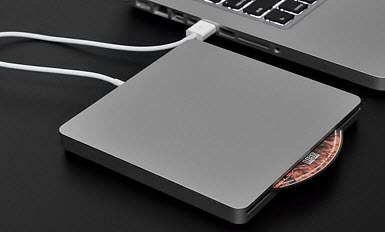 That's the idea of external hard drives for Mac. There are plenty of options you can choose from. For example, Apple offers USB SuperDrive at $80 to let users install software on Mac and also burn & play DVD on MacBook Air/Pro with Retina Display, iMac, Mac mini other computers without hard drive. But Apple's option doesn't contain Blu-Ray support, but you will have many other choices on Amazon. With an external drive plugged into Mac, users can insert the DVD and play DVDs on drive-free Mac computers as usual via a USB cable. Note: this method needs you to take the movie discs and drive whenever and wherever you want to watch DVD on MacBook Pro/Air, iMac or Mac mini computers. Watching DVDs on MacBook Pro/Air, iMac etc via external drive is easy, but not the ideal solution in many cases. For example, you won't want to lug around the movie discs and the drive only to watch a couple of titles during the layovers on a trip. The better way is to rip DVD t to hard drive in digital formats. There are also dozens of paid and free programs to do this like Handbrake and MakeMKV. The better choice is MacX DVD Ripper Mac Free Edition. This free DVD ripper for Mac will convert DVD to MP4, H264, MPEG4, MOV, iTunes, etc for easily playback on Mac QuickTime player. More importantly, compared with other freeware, it has the ability to support different type of DVDs with encryptions. Bonus benefit: By ripping DVD into digital formats, you can get rid of the discs and external drives. More than that, as the DVD drive only play DVDs with the same region code, but via the ripping, you can feel free to play DVD on MacBook Pro/Air, iMac regardless of any region code. Step 1: Free download the free DVD ripper on Mac (32/64-bit macOS Sierra and earlier supported). Step 2: Insert the DVD disc and select an output format. Also, to rip DVD to MP4 is suggested as MP4 is the most widely used if you don't know which to choose. Step 3: Click Run and start ripping. After a while, you can get the movie file and play it on any Mac computers without hard drive. Note: this method needs another computer with hard drive or an external hard drive to do the ripping in advance. If you have two computers at hand, and one of which has hard drive, you can watch and play DVD on MacBook Air/Pro, iMac via disc sharing. The function allows Macs without disc drive to play DVDs by accessing another Mac's DVD drive. Check below on how to play DVD on MacBook Pro/Air, iMac, Mac mini this way. 3. Insert the DVD you'd like to watch into the drive. 2. Select Remote Disc and double-click the computer that has the DVD sharing enabled. 3. Now you will see the shared DVD and start to watch DVD on MacBook Pro/Air, iMac, Mac mini without a hard drive. Note: this method requires two computers running at the same time when you watch DVD movies on MacBook Pro or Air, iMac or Mac mini. Besides, internet is also required to share the DVD movies. It's no brainer to play DVDs on MacBook Pro with a hard drive: simply insert the DVD disc into the drive, and DVD Player app will automatically open to play the DVD. From the DVD player you can select the title, make necessary settings and click Play. It seems simple enough to play and watch DVD on MacBook Pro/iMac with hard drive. However, there are still complaints reporting that DVD won't play on Mac. So below we offer some major fixes on how to watch DVD on MacBook Pro/Mac Pro, other computers without problems. 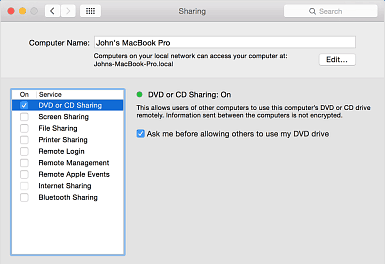 "Recently I haven't been able to play DVDs on my MacBook Pro. When I insert a DVD I hear it spinning around but then it ejects. 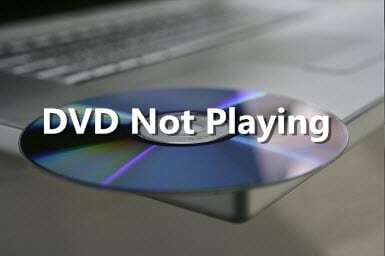 ", "Why won't the DVD player recognize a disc? The brand new dvd I insert keep getting ejected." * Check System Preferences -> CD's & DVD's to check if the DVD player is set to run when DVD is put into the drive. * Reset the SMC on Mac computers. * Check if the DVD player supports the type of disc, for example, you may need to adjust the region code for DVDs with other codes, and Mac's default player won't support Blu-ray discs. * Switch to other DVD players for Mac. * Try another DVD disc, if the problem occurs with a specific DVD, the disc may be damaged or dirty. You can try to repair the scratched DVD and try again. * If the problem continues on every disc, there may be an issue with the hard drive. You can clean the lens of the optical drive with a cleaning disk, or purge the slot with compressed air. If there are still problems preventing you to play and watch DVD on MacBook Pro smoothly, and you can identify it, you can try to play the DVD as if the computer doesn't have a hard drive. Namely, you can try an external drive, DVD sharing or free rip DVD on Mac with those free programs. Best free DVD to iTunes ripper - MacX DVD Ripper Mac Free Edition enables users to freely rip commercial & homemade DVDs to MP4, MOV, M4V and more formats with high quality reserved to watch DVD on MacBook Pro/Air, iMac, Mac mini with/without drive freely.